Just three miles from downtown Ann Arbor and the central campus of the University of Michigan, on the green fairway of a lush golf course, sits a Bed and Breakfast with the evocative name Davies House Inn Georgetown. Owned and managed by the entrepreneurial Jan Davies McDermott, this B&B in a quiet neighborhood is a good bet for visitors looking for either short or extended stays. With five units to choose from, the inn is configured to suit individuals, couples and families. The top of the line at Davies House inn is the efficiency apartment — which is a lot sexier than it sounds. It has a desk for a working space — and like the entire house, a free WiFi signal — but also a four-poster queen-sized bed (with gauze drapes that can be drawn) and a whirlpool bathtub in the en suite bathroom. With a kitchenette and private entrance, the small apartment is ideal for visiting professors, researchers and others on temporary assignments that might last for weeks or months. Yet the romantic amenities also make it a lovely retreat for couples. Although there is no official honeymoon package, innkeeper Jan happily gifts newlyweds or those celebrating an anniversary a split of champagne. Other options include a suite with queen bed, kitchenette and faux fireplace that casts heat on the nearby easy chairs; a ground-floor unit with walk-in shower that is perfect for guests with mobility problems; and a family suite with two separate bedrooms for parents and children, with a shared bathroom in-between. All rooms come with small televisions with built in VHS players; a selection of cassettes, as well as books and magazines, are available in the library in the common room. 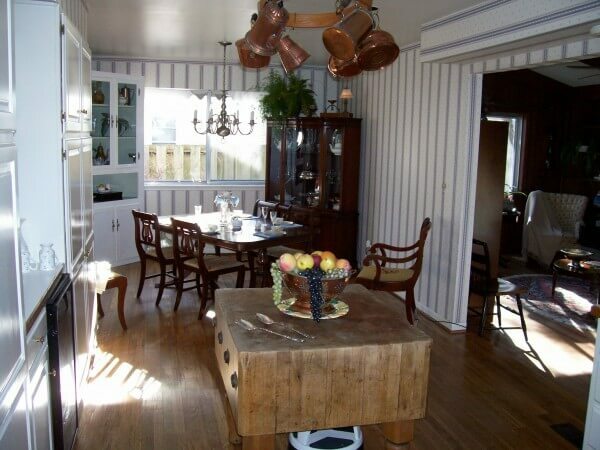 While private coffeemakers are available only in rooms with kitchenettes, there is both a coffeemaker and refrigerator for guests in the main kitchen, as well as ice buckets. Pampering robes and slippers add to the “home away from home” atmosphere. In fact, personal touches abound in a B&B where the innkeeper sees her role as a “problem solver.” Jan consults with guests in advance on preferences for breakfast and keeps items like umbrellas and extra luggage tags on hand when needed. If you’re in town for a U of M football game, ponchos and seat cushions are also available to take to the stadium. Another popular feature is grilling on the Davies House Inn’s roomy deck overlooking the golf course; just place your order for the main course, beverages and fixings, and the ingredients for pre- or post-game barbecue will be on hand. Indeed, the deck and lawn are both lovely places for breakfast or snacks when the weather is pleasant. For eating out, there is a list of recommended restaurants, both in the neighborhood and downtown. There is plenty of parking for guests with their own cars — but public transportation is also very nearby. Other transportation requests, such as airport transfers, can be arranged as well. Text by Buzzy Gordon, who was a guest of Davies House Inn Georgetown for purposes of review. Photo courtesy Davies House Inn.